At the time of the discovery of the Giants Causeway in 1694, and for the next seventy years, no suspicions were raised its basalt columns might be volcanic. But when basalt formations were discovered in the Auvergne region of south-central France, in the vicinity of mountains that might be volcanic, an argument for a connection could be put forward. It was Jean Etienne Guettard who, in 1752, first pointed out that the likelihood that the Auvergne mountains were extinct volcanoes. Guettard, however, did not believe that the local basalt was a product of those volcanoes. It would not be until Nicolas Desmarest visited the same region in the 1760s that the volcanic origin of basalt would be recognized. 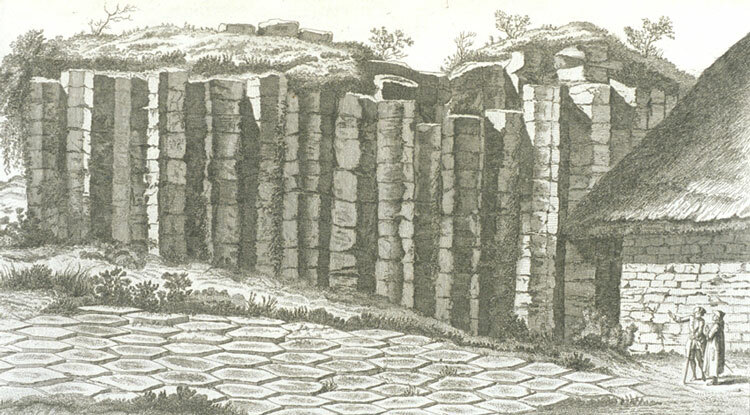 The illustration shows a basalt formation in the region of the Tour dAuvergne, France, from the Encyclopedie (see exhibit item 16).